Original post is on Streets.mn. So, it’s time for a Streets walk again and this time I’m in Rochester walking with my niece, Danielle as we went through a couple Rochester Destination Medical Center (DMC) sub-districts. Very short story – it’s where I grew up, studied piano, worked at a Shopko, rented in a 4-plex with a buddy, trekked the pedestrian subways, and fell in love with the (then) RCC music department. Downtown Rochester changes so much every time I visit. 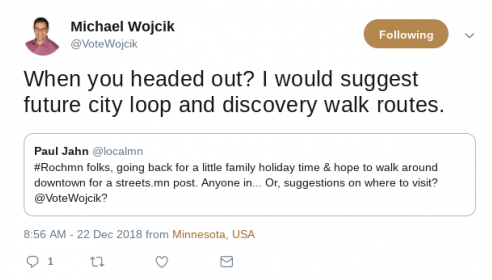 I wasn’t sure where to go so I sent out a Tweet, and Michael Wojcik was kind enough to reply. Discovery walk routes it is! The discovery walk. 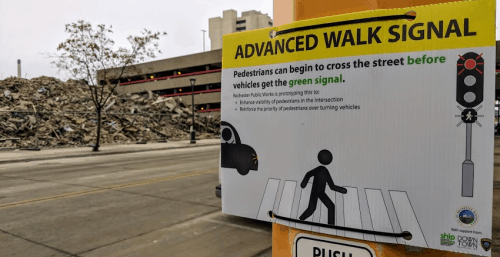 There are 6 downtown development sub-districts determined by the DMC made to build public infrastructure, including improving pedestrian safety. I chuckle as I type. Friends and family who live there consider that the whole city is now being taken over by them and the Mayo Clinic. Are these actual city districts, DMC determined districts for their organizational and PR purposes, or somewhere in between? I’ll leave that to the comments for those who are more familiar with this than I. We did take a shortened version of this through the Heart of the City and Central Station sub-districts. We talked photography a bit during this part of the walk and Danielle mentioned a couple alleys around Historic 3rd Street that works well for urban backgrounds. 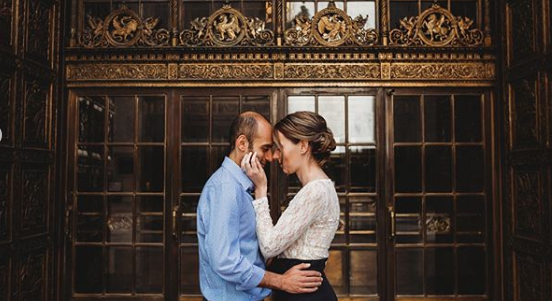 That, and places like the bronze and wooden doors at the Plummer building make compelling places for photographers, visitors, and locals alike. Side note, the carillon bells restoration project is scheduled to be completed by the end of January, 2019. The determined Heart of the City area is centered around Peace Plaza, including the Chateau Theatre. 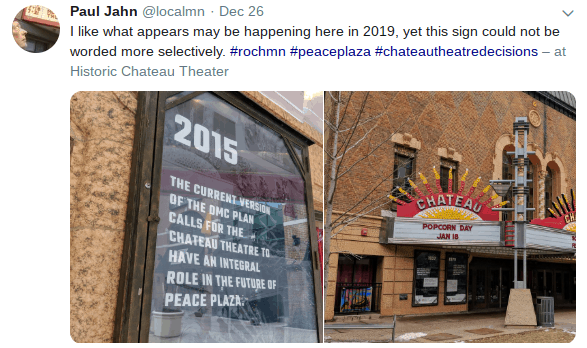 Over the years the Chateau’s been everything from a movie theater, to a Barnes & Noble, and now an empty theater with a selective DMC-worded plan. Albeit likely delayed by the city council, it looks like this may open up as a slightly higher capacity venue as early as mid-2019. Word in the fam is before my time there was a really nice theater organ inside. Of course, I digress. I was also hoping to see zebra stripes in the Heart of the City as traffic gets backed up often. Crossings are indeed clearly marked, just not zebra striped. A partial zebra stripe exception is made at the corner of 1st Ave and Historic 3rd St SW. I’m a big fan of these and believe it directly helps contribute to pedestrian safety. The city of Rochester does accept neighborhood permit applications for creative crosswalk painting. 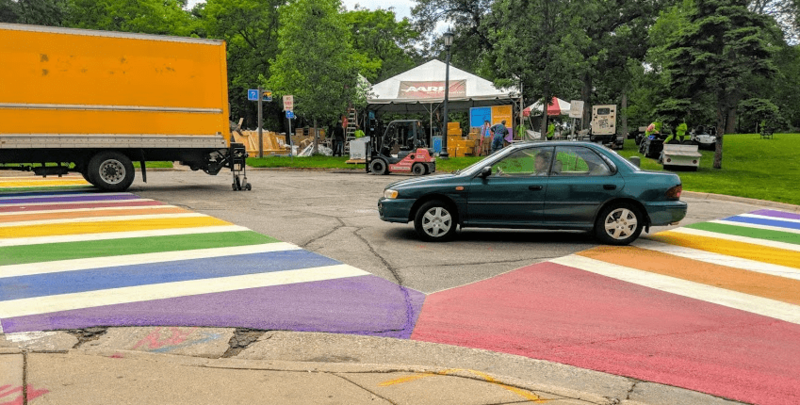 A similar example came to the Minneapolis Loring Park area in a joint effort to help celebrate the 2018 Twin Cities Pride Festival in addition to implying drivers know that pedestrians cross right here. What I don’t know is if these applications are limited to city neighborhoods or open to the DMC determined 6 downtown sub-districts. Definitely comment if you have insights. A revised and seasonal Nice Ride is an option again around downtown. The initial pilot closed, then opened up again as of Sept. 2018. Credits to Hannah Tiede for this KAAL article. I do really believe that the 2016 Nice Ride pilot in Rochester was implemented just to fail from the start, either from opposing councilmembers or more vocal NIMBYs. Originally, there were just two Nice Ride stations. One at the People’s Food Co-op (PFC) and the other at Peace Plaza mentioned above just a few blocks away. For transportation, does anyone ride for just a few blocks? The pilot did had some kind of option to rent for 24 hours to get home and back to a station, but it didn’t really stick. The revised version can only help, especially if more bike lanes and the planned DMC public infrastructure build takes effect. 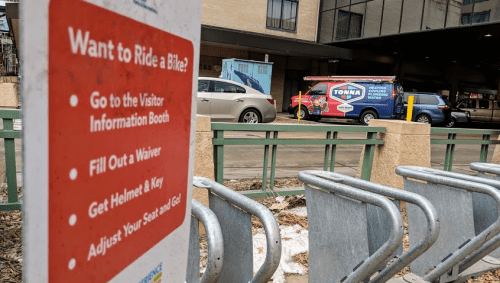 The goal is to get people thinking about different ways of getting around town, especially when there is heavy traffic and parking space shortages downtown. Although closed for the Winter, here’s a Nice Ride station by Peace Plaza. The DMC determined Central Station deserves a mention. For years, and still is to a point, a somewhat nested area in the north end of downtown. Within it, the Jacobson building now fills a square block hole in the ground deemed for this development the last year or 2. It also includes the future home of a DMC proposed Hyatt House. 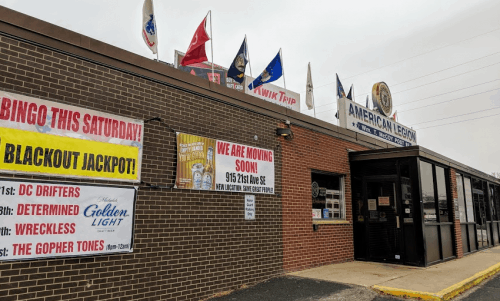 They’re going to bulldoze and replace the American Legion which has been here for as long as I can remember. From written sources anyway, the move seems welcome, or amicable, and it’s definitely close to the Mayo Clinic. Although, I don’t know the deets behind it. We didn’t get to the determined sub-districts like the Downtown Waterfront which could probably be an article in itself. It’s always been one of my favorite areas of town. Nonetheless, 13 months after my last visit, it’s just amazing to see how much downtown has changed (again) in that short amount of time. With true affordable housing, their planned sustainability practices, and pedestrian safety efforts, they could set a bar for other cities to follow. Other photos were taken, and here’s a shared Google Photo Album. Of course, let us know your thoughts in the comments!